I have a baby shower to go to tomorrow and it’s the first time I’ve had the chance to knit something girly (everyone I know was or is having boys!). I didn’t have enough time to knit a more complex project and wanted to minimize finishing (buttons anyone?) so I picked a cute bolero pattern from Vintage Knits for Modern Babies. This, along with Natural Nursery Knits, is my go-to for adorable, gift-worthy baby knit patterns. More knitting details for this project (yarn, needles, etc) can be found here. Hi! 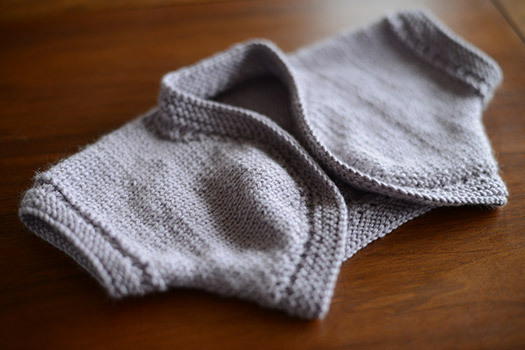 I’m interested in the pattern for the knitted baby bolero but the link does not work anylonger, do you know where I can find the pattern? Thanks for letting me know those links were no longer working–I’ve fixed them (they link to the actual books on Amazon). Happy knitting!